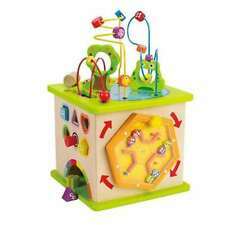 Colorful wooden cube features 6 different activities: tic tac toe blocks that spin, wire and bead play, sliding shapes and abacus counting beads. Bead and wire play can be reversed so it tucks into the cube for easy storage or can be used as a separate table-top activity. Quality Pretend Play toy Made of Wood. One of these standards is that lead is not permitted in any toy/collectible product sold in the USA. 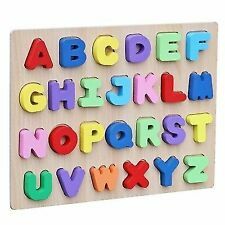 A great way for children to learn their letters,Featuring 26 wooden pegs, one for each letter in the alphabet, this vibrant puzzle is ideal for helping to develop letter recognition and prereading skills. The only piece need to be attached is the removable top parking lot, other no assemble needed. The vehicles also passed tensile tests of ASTM, the wheels can not be pulling out without violent destruction. Note: It's better for kids to play with it, under the adult supervision. It can develop the imagination of kids. Material: Wood non-toxic paint. Made of high quality wood material. It is design for baby hand activity. This ultimate shape sorter features 12 chunky, vibrantly colored shapes that make a satisfying "clunk" as they drop into the natural-finish hardwood cube. Then open the lid, take them out and start all over again! Don't these cupcakes look positively scrumptious?. Add them to your next tea party for a colorful, sweet treat! Playing pretend is a great way to think creatively and develop crucial social skills like sharing, and as always, Wood Eats! Multilevel, prehistoric dinosaur playset, fun for imaginative play. Get ready for a prehistoric adventure with the Kenyield Dinosaur Wooden Playset. With colorful details on multiple levels and 4 sides, plenty of kids can get in on the action. 9Pcs Kids Wooden Play Food Chopping Toy Set Preschool Child Cutting Fruits Toy. Fruit pieces slice apart. Self-stick tabs hold pieces together, then "slice" apart. Perfect for pretend play and introducing concepts of whole and part. The Magnetic Train Toy Set by Hey! Play! is an easy-to-use, learning magnetic train that teaches toddlers about trains, animals, connectivity and movement. It is bright, colorful and provides lots of fun for your little train engineer. Each car connects with a magnet and is interchangable. Your child can learn about trains, connectivity, animals, and colors, all while having fun!!! Made of Wood 4 Train Cars, Engine, caboose, and two cargo cars 3 Wooden animals, elephant, giraffe and zebra Assembled dimensions: 13 inches long x 1.25 inches wide x 1.75 inches high . One is missing a tongue. 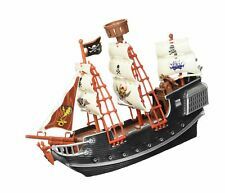 Plan Toys Lot Of Wooden Dollhouse Dolls & Furniture Ryans Room Melissa & Doug Includes: Dad, Mom, Girl, Boy, Baby Girl, Baby Boy, Cat, Dog and Fish Dolls Wardrobe, Changing Table, Crib, Lamp, 4 Small Tables, Toilet, Sink with Mirror, Cat Dish and Dog Dish. Good used condition with normal signs of use, the pink Baby has some staining. Please see pictures for complete details. Match-and-stack set of 6 nesting buildings and 6 wooden vehicles. Buildings nest for neat and easy storage. Wooden toy Car unbranded handmade in used condition. Wooden toy Car unbranded handmade in used condition.. Condition is Used. Shipped with USPS First Class Package. Magnet on the string is used to sort the colored balls into the correct color animal. Great educational toy! Non-removable pegs take turns showing their smiles while your toddler has fun naming the colors and enjoys practicing fine motor skills. Trending at $16.17eBay determines this price through a machine learned model of the product's sale prices within the last 90 days. 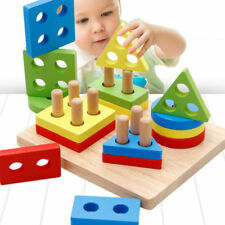 Set of 10 colorful nesting and stacking blocks. Illustrations feature animals, numbers, shapes, and colors. Great for hand-eye coordination, number recognition, problem solving, and construction play. Kids can match the colors, sort the shapes, and solve the puzzle as they manipulate the color blocks and turn the hands, building cognitive and motor skills all the while. Suggested age: 3 years and up. NEW ITEM LAUNCH -- PROMOTIONAL PRICE! They feature bright colors and beautiful designs to intrigue toddlers. 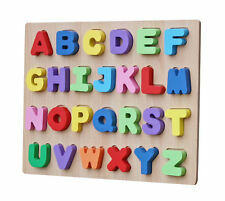 Ideal toy for toddlers, pre-schoolers and young children who love wooden puzzles and nature. Realistic Pizza Toy Set. Ideal for pretend play and kids food parties. Melissa & Doug Car Carrier Truck and Cars Wooden Toy Set With 1 Truck and 4 Cars. Condition is New. Shipped with USPS Priority Mail. Material: Wooden. TypePre-School/ Young Children's Toys. Imaginative play : features12 colorful pieces and wooden cube to inspire hours of good old-fashioned creativity without the need for electronics. Stacking train blocks wood from Circo dated 2009 - excellent toy for teaching shapes, colors and hand/eye coordination for your little one! CIRCO - 2009. The "engine" section bottom is stamped with CIRCO Target 204060046 F16892723 10/09. Set of 3 wood dinosaurs, handmade in USA. 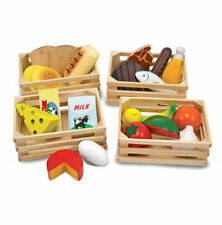 Feed the imagination with this beautifully crafted wooden play food set! 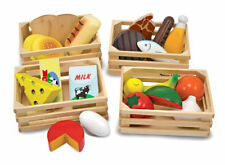 The smooth, solid wood pieces are perfectly sized for small hands to help promote fine motor skills and dexterity. Melissa & Doug Wood Toy Xylophone Musical Instrument Kids Toy. This is made out if wood. It does not include a mallet. Very nice and clean. Please see pictures as they are part of the description. This item will ship USPS. U.S. Bidders with Paypal only. Please pay with PayPal when the auction ends. If you pay by 10:00 am the morning after the auction, your item will ship that same day. I ship Monday - Saturday unless the post office is closed for a holiday. Thank you for your business! I appreciate it! New in box, not played with; cute set of pets and their accessories for your dollhouse. Nice for kids, not breakable or delicate. Melissa & Doug Classic Toy - Farm Tractor (5pieces) NEW. Condition is New. Shipped with USPS Priority Mail. Magnetic pieces include dresses, hats, and more. Interchangeable pieces for easy-to-make, easy-to-change outfits. Melissa & Doug Low Loader Classic Toy Vehicle #4550 BRAND NEW . Condition is New. Shipped with USPS Priority Mail. janod Woodsn Toy Microwave. Condition is Used. Shipped with USPS Priority Mail. Material: Plastic. Includes combination lock. If you still wish to receive your item(s), you will have to place a new order. Secure lunches and snacks from refrigerator thieves. Size: 7 1/2" x 11 x 7 1/2". New in package wooden slingshot. Manufacturer: BBH. Traditional style, made of real wood. Comes with attached rubber sling and black leather pouch. Length 7.25" x Width 3.5". Great for reenactments or costumes too. Safety glasses should be worn when use. Since these do shoot projectiles, proper adult supervision should be supplied. These should be used for target shooting only. Condition is used from normal wear and tear. Moveable minute and hour hands. There are 12 unique shapes with numbers to complete the puzzle. Sturdy wooden construction. This nice truck crayon holder is handmade and holds 24 crayons. The wheels roll and very solid. It does have a few nicks from use, as well as a small red spot near the cab of the truck, but overall very nice! From our Safari range, this beautifully crafted wooden musical carousel featuring four safari animals, is the perfect addition to a child's nursery. Wind up the music box, and the tune of 'Wish Upon a Star' plays as it rotates. Plan Toys Roller. Condition is Used. Shipped with USPS Priority Mail.